Still today one is astonished at the universal genius Leonardo da Vinci: his creativity, his spirit of discovery and his futuristic thirst for exploration have infuenced centuries and still impress the world today. Whether it was the dream of fying, curiosity about human anatomy, the art of painting or even the invention of war machines: his imagination knew no limits! Leonardo’s many talents and interests seemed immeasurable. But what drove this brilliant artist? What makes his art so revolutionary? 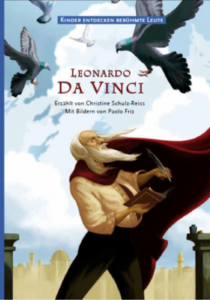 In the second volume of the series “Children Discover Famous People”, author Christine Schulz-Reiss immerses in the mysterious world of da Vinci and doesn‘t only write captivatingly about his eventful life, but also shows why he was long ahead of his time. 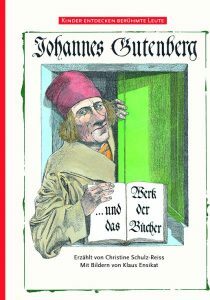 This gives the young readers a fantastic insight into how Leonardo da Vinci reinvented the world. The impressive illustrations by the artist Paolo Friz capture da Vinci’s life in a breathtaking way and from an amazingly new perspective.